ZANDA PANDA's Favorite People List! Thank you for signing up for the Zanda Panda mailing list. 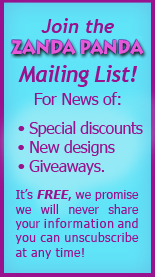 We will only send occasional announcements of new designs, contests, coupons, etc. Your personal information will never be shared and you can unsubscribe at any time. Tell us about yourself! We'd love to get to know you better and see your preferences! All information is optional (except for an e-mail address), add whatever info you'd like to share. What are your favorite desserts / flavors? What are your favorite animals/ holidays/ themes? Do you enjoy creating arts & crafts? What kind? How did you hear about ZANDA PANDA? What's important to you when purchasing bakeware? Thank you very much for your participation! Your input is invaluable to us. Getting to know you and your preferences will help us to create better and more interesting designs in the future.